Simple fact of life: machining produces heat. It’s an unfortunate side effect of metalworking and causes all kinds of headaches for machinists. It stands to reason that if you can remove it from the process, good things happen – faster cycle times, longer tool life and increased part quality. Imagine the results if you could lower the temperature down to -321°F right where the tool meets the workpiece. It would be amazing, right? Well, that’s the theory behind cryogenic machining. How does this all work in real life? This article describes what happened when Doosan, a vendor, a distributor and a customer joined forces to improve the machining of parts for the airplane trade using cryogenics. Milling Precision Tool Company (MPTC) is a CNC machine shop in Wichita, Kansas that caters to the needs of the local Aerospace industry. With a staff of about 30 employees, they work with customers like Cessna/Textron, Lockheed Martin Aeronautical Division and Boeing, and many more. Since their doors have been open for 55 years, they must be doing it right. With a forward-thinking culture, the organization is continuously re-inventing itself – improving in-house processes, having a lean approach, implementing one piece flow, and always thinking of ways to reduce setup times. As fate would have it, Doosan had just joined forces with 5ME®Cryogenics to showcase the advantages of cryogenic machining. 5ME®’s unique, multi-patented cryogenic machining process is a breakthrough technology that enables higher metal removal rates and longer tool life by delivering liquid nitrogen at -321°F through the spindle/turret, cutter body, cutting tool, and directly to the cutting edge. This environmentally friendly machining technology increases throughput, part quality, tool life and profitability, while eliminating cutting fluids and reducing energy consumption. The Doosan NHP 6300, a 50 taper, 630mm pallet horizontal machining center equipped with a 10,000 r/min BIG PLUS spindle, was the machine chosen as the foundation for Milling Precision Tool’s cryogenic applications. The NHP 6300 had the travels and all the machine features they needed to tackle their parts. Denny Creitz, the Salesman from Machine Tool Specialties, the distributor for Doosan Machine Tool America in that region, knows his stuff. Over the past 5 years he’s been working with MPTC on the standardization of equipment within the shop. He invited them to Warren, MI where 5ME®and the NHP 6300 were located, and oversaw the hogging and finishing test cuts as a part of the vetting process. Convinced it was what they needed, MPTC cut their purchase order for the NHP 6300 equipped with cryogenic machining on the spot. According to Will Gruber,Manager of Marketing & Channel Sales for 5ME®, Milling Precision Tool took delivery of the machine and have been "cooking" non-stop with the NHP 6300. MPTC started tackling hard metal applications in titanium (6AL4V), stainless steel (15-5 PH) as well as other alloys. They started machining the parts previously cut using coolant with cryogenic technology and have seen massive improvements to cycle time, some as close as 50% reduction. Material removal was approximately twice the rate of conventional flood coolant. They also realized a 30% savings with cryogen over use of coolant (coolant cost plus coolant disposal cost). While the tool life remains constant at 60 minutes (the industry standard), MPTC is machining 2-2.5x faster, so the tool life per part (material removed) is increased 2-2.5x more, which means less tool cost per individual part. All of this resulted in lower parts costs and faster deliveries for their clients. 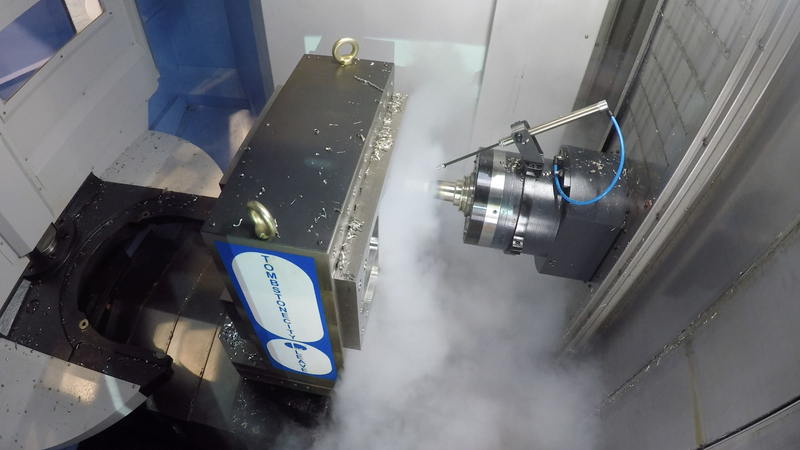 Based on their experience, Milling Precision Tool has become a bit of a showroom for 5ME®, Doosan and Machine Tool Specialties, as well as for local Aerospace clients so they can see first hand the benefits of cryogenic machining. MPTC conducted a two-day presentation for Cessna/Textron in their facility, showing them the machine, explaining the benefits of liquid nitrogen machining, and displaying sample workpieces to show the types of finishes that can be accomplished without traditional coolant. That led Cessna/Textron to update their suppliers’ manufacturing specifications to include cryogenic machining as an allowable methodology to machine parts for them. As Milling Precision Tool searches for new bids, and their business grows, there has already been talk about expanding the facilities and adding more machines, both for traditional aluminum and hard metal cryogenic machining. Eventually they would like to get to a point where lights out machining is possible. Although their volumes may not be considered high production, cycle times can be long when machining Aerospace parts so implementing automation is another plan for the future. Luckily, Doosan offers a retrofittable linear and rotary pallet system for the NHP 6300 that would help the operator walk away from the machine for a shift and also minimizes setup time when having to machine a variety of parts. This installation was the very first cryogenic horizontal machining center in Wichita and the first HMC for Milling Precision Tool. Being at the forefront of this technology was important for MPTC. It allows them to introduce first hand the benefits of the technology to their customers, who are important key players in the Aerospace industry.